I had this for a year now, and it still is in good shape. Definitely durable. The shoe is longer than your shoe size, which gives extra foot room. 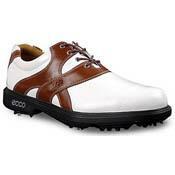 It is lighter than some other golf shoes, since it isn't waterproof, but don't count on it to be as light as your sneakers.